"If the UK had Lady Macbeth instead of Theresa May, they would have had Brexit sorted out months ago." English teacher Robert Devlin smiles as he remembers one of the last things 16-year-old Connor Currie said in his classroom. Staff hope that by sharing their memories of their lost students, the other young people at St Patrick's Academy in Dungannon will feel encouraged to share theirs. 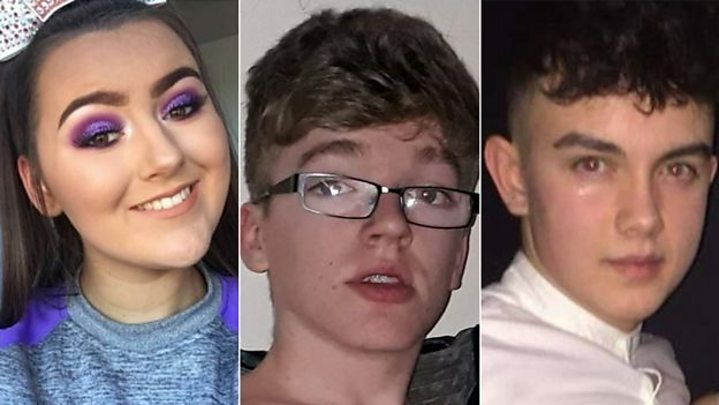 Of the 1,300 students, dozens were at the Greenvale Hotel on St Patrick's Day when a crush at the door of a disco left Lauren Bullock, 17, Morgan Barnard, 17, and Connor Currie dead. Lauren was a student of the neighbouring St Patrick's College - both of the boys walked these Academy hallways. But these hallways feel different this week. "We are experiencing a number of students who are just totally frozen," says Jean Gascoigne, the school's long-standing resident psychotherapist. Image caption Jean Gascoigne says some pupils "are just totally frozen"
Jean has been providing back-to-back sessions with groups and individuals trying to process what's happened. A critical incident team has also been provided by the Education Authority, they too are constantly on hand for anyone who needs them. "We're still in the early stages of trauma - there's disbelief, shock," said Jean. "Our main aim over the next few days, along with the crisis team, is to help students to begin to regulate their emotions and begin to understand that their emotions are normal." Talking will be key to helping this school community come to terms with this weeks tragedy. In the schools main reception hall three tables have been laid out with three photographs, three pens and three books of condolences - one for each victim. "Fly high Morgan," reads one message. "Thank you for helping me get home that night," reads another. A constant stream of pupils pour their hearts onto the page. As we watched a mum, who had paused her school run temporarily, came in from the car park to add her message to the book. Mary Coyle says teaching Morgan Barnard Irish was "very pleasant" because he loved the language. "Morgan wasn't just part of the class. Morgan made the class," she smiles. "A lot of our Year 12 and 13 students were at the event [on Sunday] and are reliving the event. And that is what's so difficult. "They all felt incredibly lucky that it wasn't them and also severe grief. "There's no golden rule for teachers. We're taking it day by day. We will have to get back to a sense of normality but that hasn't been the case this week obviously. Bit by bit we have to ease the children along." Mary says the counselling services have been busy. So too has the school Oratory where a small alter sits with framed pictures of Connor and Morgan on it. "They have been using [the Oratory] that a lot for private prayer and coming up in small groups of their friends. "Every student reaches out to a different person, a different teacher. They respond in different ways and the school has to try and facilitate that as best as possible." Mary says staff are watching to see how individual students are coping. But the staff too are receiving support. "With the level of trauma that we are dealing with - that raw upset, grief, pain and bewilderment - we need to help staff to debrief from all of that," said Jean. There is no exact science, or proven path to get through days like these at schools like St Patrick's Academy. But authorities know that, but they hope that by talking and coming together they can help themselves, their community and the families most affected by this tragedy get through this most difficult of times.